US President Donald Trump says reports stating he was 15 minutes late to meet the Queen of England was “fake fake disgusting news”, adding that it was the queen who made him wait. He also dismissed claims that he overstayed his welcome during the royal encounter at Windsor Castle last month. “I was about 15 minutes early and I’m waiting with my wife and that’s fine. Hey, it’s the Queen, right? We can wait. But I’m a little early. “And then here’s the rest of the story. So they said I was late when I was actually early, number one. Number two, I guess the meeting was scheduled for 15 minutes and it lasted for almost an hour. The president overstayed! “But we got along fantastically well. But the time went by – you know, sometimes you get along and the time goes by. 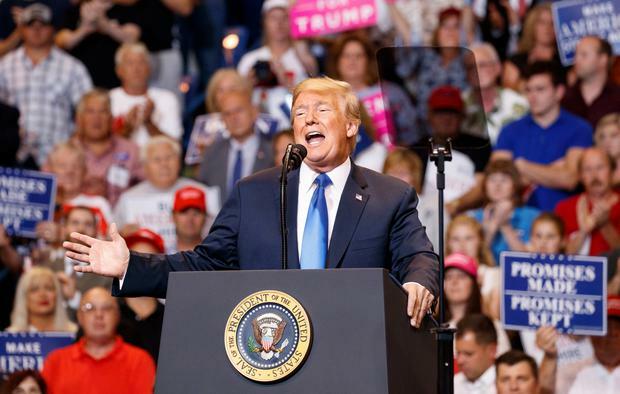 The president was speaking in Pennsylvania, a state he took from the Democrats in 2016 and that is home to a Senate seat he is trying to place in the Republicans’ column this autumn. But the race between Republican Lou Barletta and two-term incumbent Democrat Bob Casey took a back seat to Mr Trump’s invective against the media, which came amid a backdrop of antagonism to journalists from the White House and hostility from the thousands packed into a loud, overheated Wilkes-Barre arena. He also tore into the media for diminishing what he accomplished at his Singapore summit with North Korea leader Kim Jong Un; he complained about the tough questioning he received in Helsinki when he met Russia’s Vladimir Putin last month; and he began his rally speech with a 10-minute remembrance of his 2016 election night victory, bemoaning that Pennsylvania was not the state to clinch the White House for him only because “the fake news refused to call it”. “They were suffering that night, they were suffering,” he said of the election-night pundits. He then promised that the Keystone State would deliver his margin of victory “next time”. “Only negative stories from the fakers back there,” the president said. With each denunciation, the crowd jeered and screamed at the press in the holding pen. The inflammatory performance came hours after White House press secretary Sarah Huckabee Sanders refused to distance herself from Mr Trump’s previous assertions that the media is the “enemy” of the American people. Pressed during a White House briefing on the issue, she said the president “has made his position known”. In a heated exchange with reporters, she recited a litany of complaints against the press and blamed the media for inflaming tensions. “As far as I know, I’m the first press secretary in the history of the United States that’s required Secret Service protection,” she said, accusing the media of continuing “to ratchet up the verbal assault against the president and everyone in this administration”. Although Mr Barletta’s bid was an undercard to Mr Trump’s main event, the president did bless the congressman’s bid. Mr Trump, who has accelerated his campaign schedule in recent weeks to help the Republicans he favours in primaries and November’s mid-terms, was the first Republican to win Pennsylvania since 1988. He and Mr Barletta, who is trailing by double digits in the polls, share hardline immigration views, and the president mocked Mr Casey with his own derogatory nickname, Sleeping Bob. But his focus was on defending his own accomplishments and beliefs. He pushed for tougher borders, defended his kid-glove approach to Mr Kim and Mr Putin, criticised the Democratic leadership of Charles Schumer and Nancy Pelosi, and raved about the booming economy, claiming his blue-collar supporters in states like Pennsylvania are the biggest beneficiaries.